Why are so many people around the world fascinated by Tibet? The Tibetan pictures below will help you find out. These public domain pictures of Tibet are presented with comments from those who have lived there. Where is Tibet? It is in the Himalaya Mountains near the China-India border. Politically it is an autonomous region (like a low-population province) of China, which is a topic of debate that I will not get into. 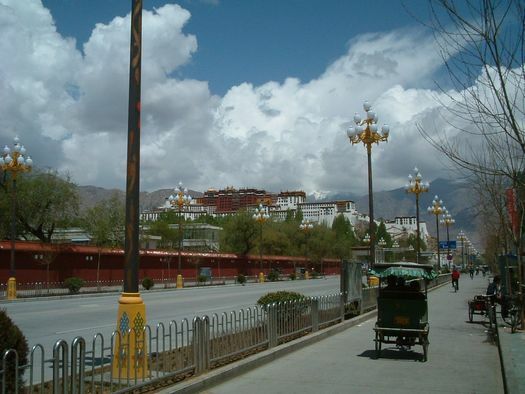 I lived in Lhasa, the capital of Tibet, for three years and I prefer to focus on the land and people, not the politics. If you want to read about the political situation, look elsewhere. Above is a photo of Lhasa, the capital of Tibet, taken when I was on a hike on one of the mountains that surround the city. Although people talk about the Tibetan Plateau, do not think of that as flat. All it really means is that the average altitude is high. Tibetan pictures show there are mountains all over; the cities and settlements are built in the rare flat spots in valleys. Looking down into Lhasa (spelled "Lasa" in Chinese pinyin) the centrepiece of the city is the greatest of Tibetan symbols, the Potala Palace. Do you see it in the picture above? It sits high on a hill in the middle of the city. 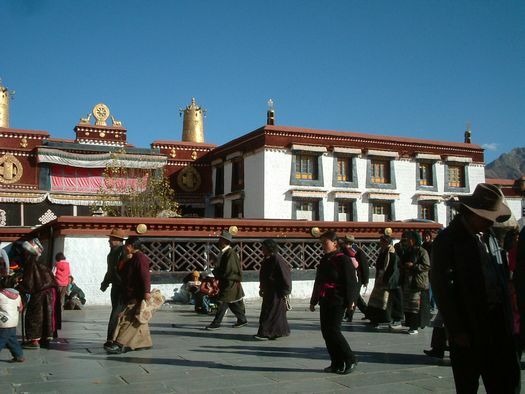 In fact the only taller structure in Lhasa is the public security building, although there are monastery buildings that look down on it from mountains around the city. Collections of photos of Tibet always show mountains. The mountains around Lhasa are only about 1,000m tall relative to the city, but the city's altitude is about 3,700m (12,000 feet). That means the air is thin and that lack of oxygen affects everything about life there. 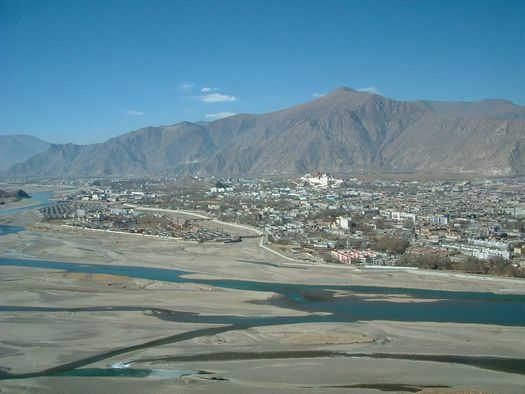 The air is dry because of the altitude and people need to drink a lot of water, particularly those from lower altitudes when they first arrive in Tibet. The worst problem though, is simply the lack of oxygen. It is common to see newly-arrived tourists looking deathly pale. That's something you don't see in the tourist agency Tibetan pictures. Lhasa hotels all have oxygen tanks available for emergencies, and they are often used. In fact, acute altitude sickness kills a couple of tourists each year. Assume you came from a low-altitude land to Lhasa. After a week of living at this altitude, your blood chemistry will have started to change (more red blood cells) to help carry the oxygen more efficiently. For the first half-year your lung capacity will expand, and you'll learn to take deep breaths. Before you mentally adjust to breathing deeper and more often, you may have serious trouble sleeping - waking up panting for breath. Despite these body adaptations to altitude, long-term visitors can still expect to need an extra hour of sleep each night. Also, any illness takes twice as long to heal, whether it's a simple cut on the finger or a minor cold. A major cold can make you spiral downward enough to require emergency medical evacuation to lower altitude. Among the Tibetan pictures available on the Internet, you can find many photos of the Potala and many of them make it appear like it is surrounded by open land. It is not. It is in the middle of the city. There is a small park area immediately behind it (north) and a huge public square in front (south) but elsewhere around the palace are fairly busy city streets. In Tibetan Buddhism, the Dalai Lama is the highest leader, although at various times in history he has had very little actual power compared to the powerful monasteries around Lhasa. The Lonely Planet Tibet guide has a good, short, interesting, and unbiased history of Tibet. It's worth reading. Until 1959 the Dalai Lama and his predecessors lived in the Potala Palace and as such it is the centre of Tibetan culture. Tibetans honour it, and try to get merit for their future lives, by doing a kora around it, that is, by walking a circle route that goes around outside the palace. There are koras of various lengths in Lhasa, the longest one being around what used to be the entire city. While the Potala is the centre of Tibetan culture, the centre of Tibetan Buddhist religion is the Jokhang Temple, a 10-minute walk away. It sits in the old Barkor section of the city. Any time of the day you'll find Tibetan pilgrims bowing in front of the temple. It's a great place to take Tibetan pictures of visiting nomads. A continuous stream walk the 10-minute kora through the barkor around the temple, and when it is open to visitors many do the inner kora that just takes a couple of minutes. Click here to see some Tibetan nomads doing koras. Bordering the public square in front of the Jokhang Temple and all along the kora around the temple are little shops. 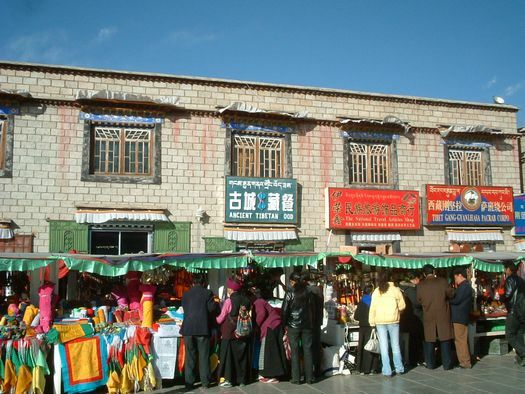 Many sell Tibetan Buddhist religious articles ranging from katas (long scarves given to honour people) and prayer flags, to long worship horns, but there are also many souvenir stores selling things like T-shirts and other places selling music, jewelery, and luggage. Since about 2003, on one corner of the public square (farthest away from the temple, but easily visible with with its gaudy orange sign) is an outlet of the fast food chicken chain called Dicos. Perhaps the gaudy orange is not minded as much because Tibetans do love colour! Look at the stand on the left in the photo above. Multi-colour prayer flags are seen all over. From my apartment window at Tibet University I could see masses of these flags covering parts of Pumbaree, a holy mountain right beside Lhasa. Up in the mountains you also see some colourful nature, such as these Tibetan flowers. Tibetan pictures show many unusual things, but I'd bet this shop beside the Jokhang square gets many pictures and comments. What does a blender have to do with a yak? 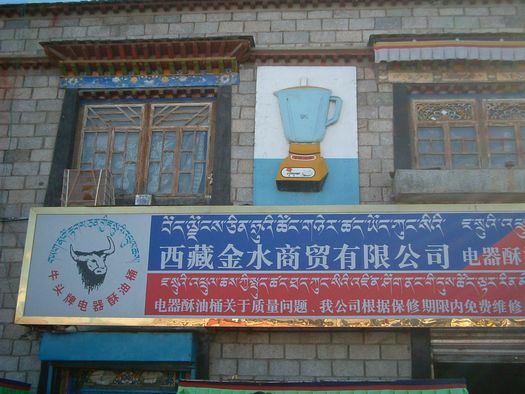 Answer: Blenders are used to make yak butter tea. Butter tea is an acquired taste that I never acquired. There is a general smell of yak all over Lhasa, but the yak butter tea, sometimes made with almost rancid butter, is particularly strong-smelling. The Tibetan sweet tea is much more palatable. You don't see many yaks actually in the Lhasa city streets, except in pieces in (or on the sidewalk in front of) the butcher shops. The fields and mountains around Lhasa have lots though. Very often I could look through my apartment window and spot yaks grazing on the mountains around the city. Here is one of a herd of yaks I walked through on a mountain hike. Despite the scary-looking horns, they're pretty docile creatures. 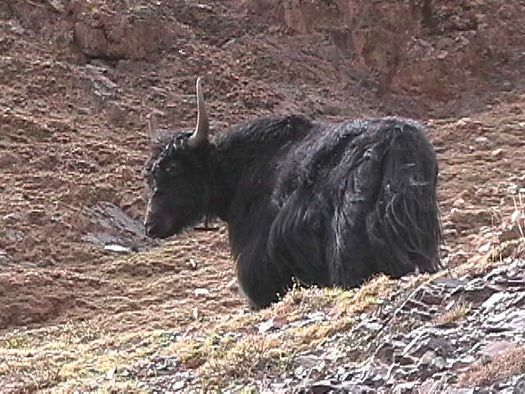 In most Tibetan pictures I've seen featuring yaks, their primary interest is in grazing. Click here to see a collection of yak pictures. 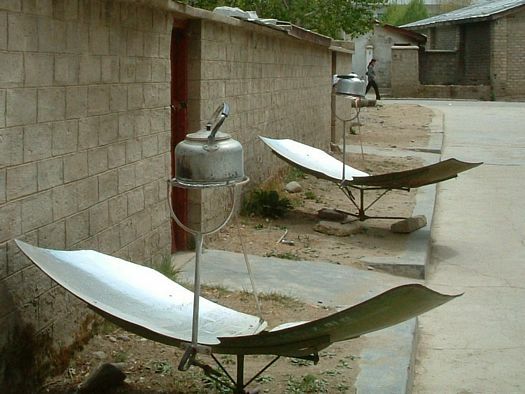 This is a Tibetan solar cooker. A friend visiting first guessed these were satellite dishes but no, these are used to boil kettles of water. You see them all over. Since the early 2000s you can also see many rooftop solar water heaters providing household hot water. At the high altitudes of Tibet, with so much less atmosphere above, the sunlight is intense. You need to beware of dehydration and sunburn, but that's not hard to deal with. Even on the coldest winter days, the temperature is reasonably comfortable in the sun. You can walk on a sunny sidewalk in a light jacket while one metre away in the shade there is ice. 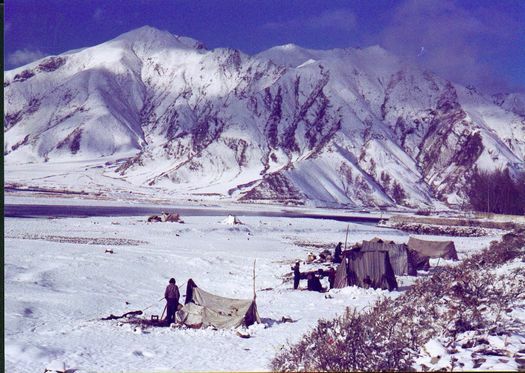 Here is a sight rarely seen in Tibetan pictures: snow-covered Tibetan nomad tents at the river beside Lhasa. Many Tibetan nomads come into Lhasa for the winter, and some pitch tents on the river bank. The rare thing about this 1998 Tibetan picture (scanned from a printed photograph) is the snow! There is very little rain or snow in most of the valleys of Tibet near Lhasa. The dry air at those altitudes simply doesn't carry much moisture, and what does fall is often on mountaintops. Lhasa winters are cold and you might see snow-covered mountaintops all around, but there is rarely snow on the ground in the city. When there is, beware of random snowball fights. Everybody seems to run wild with snow fun before the noonday sun melts it all away. 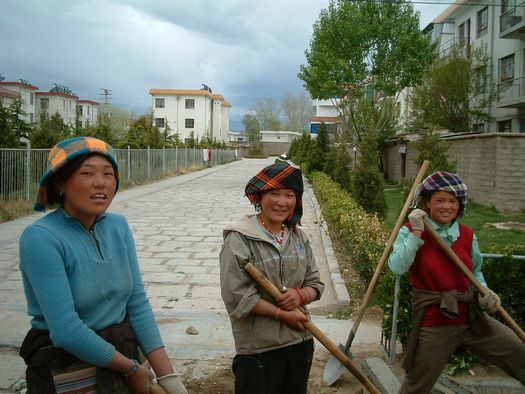 This ditch-digging crew of young Tibetan women had the same sense of fun and relaxed attitude toward life that I often saw during my years in Tibet. It's surprising really. The climate and remoteness make life in Tibet hard, especially for the nomad people. Some statistics say that around 1950 the life expectancy in Tibet was as low as 36! In the last 30 years China has pushed development in the Tibetan Autonomous Region and some recent statistics claim that life expectancy has risen to 67, but as with any statistic involving Tibet, the figures are debated. Most Tibetan people seem to react to the hard life not with despair but with a sort of cheerful resignation, savouring every chance to enjoy a rest or a smile. 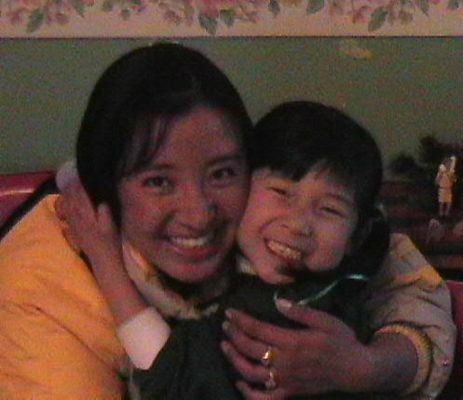 Looking at any collection of Tibetan pictures, you'll see a lot of smiles. 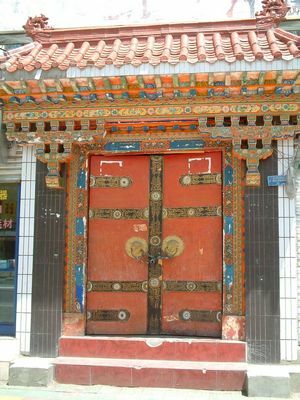 Let me end this introduction by showing one of the most intriguing features of Tibetan culture: They love decorated doors! Click here to see Yak Pictures. Yaks are hairy and smelly, but incredibly useful and a vital part of Tibetan life. Click here to see public domain photos of Tibetan wild flowers. Scattered around the rugged landscape of Tibetan mountains you can see beautiful flowers growing among the rocks. Click here to see photos of the nomadic part of Tibetan culture. Tibetan nomads are a colourful part of life in Tibet. In Lhasa, particularly in the winter, you see them constantly.